Do I need a will if I have no assets? Do I need a will if I'm married? What if I have a trust? Here are the answers to these questions and more. It has been disastrous when celebrities pass away without a will. Elvis, Marlon Brando, Michael Jackson, and Prince all left their families to fight over their estates. You may not have asked yourself, do I need a will? To determine who needs a will, there are a few key factors to consider. What Does a Will Do For You? You are probably asking yourself why do you need a will. A will lets those that you leave behind know what you intended to do with your belongings. It allows your estate to be distributed and settled out quickly. The quicker your estate is handled the less stress your loved one has in the grieving process. Probate that lasts years can have great consequences on those who inherit when it comes to tax liabilities. If you did not choose an executor, one is hired to distribute your estate. This means fewer assets are going to your loved ones. The longer the process takes, the more expensive the whole thing becomes. You want your estate going to people you care about, not the court system or province. The passing of a loved one is a stressful time for anyone. No one wants to leave their family and the province to determine what should be done with your assets. People are emotional, and no one makes rational and logical decisions while they are grieving. 1. What Are Your Family Dynamics? Family dynamics are a key part of the distribution of belongings after a family member passes away. It is a sad reality, but people let their emotions rule, and families break apart over little disagreements. When asking yourself, do I need a will, think about if you have family heirlooms. Determine who will inherit what items before you pass. This will help prevent or mediate family disagreements. What you need to remember is that what is fair, is not always equal, and what is equal isn't always fair. The court system does not take into account family relationships or history when distributing your assets. 2. Do You Have Minor Children? If you have minor children it is vital that you have a will to ensure their care and inheritance is done as you intend. Losing a parent is tough, by having a plan in place for your children's care you will facilitate a smoother transition for them. How children inherit depends on multiple factors. When children are the descendants of both you and your spouse they may not receive anything in probate. You also need to take into account whether your children are of the age of majority, meaning they are over 18. Children that are considered adults in the eyes of the law are treated differently for inheritance. For minor children, you'll want to ensure that money is set aside for their care. You may also want to have a trust set up for them to inherit money later in life when they are mature enough to handle it. A Will also lets you appoint Guardians and Alternate Guardians to ensure your children are looked after you die. 3. Do I Need a Will If I Am Married? If you are married your spouse may inherit all or a large portion of your assets in probate. For provinces that follow the community property rule, your spouse will inherit everything if you don't have children, or all of your children are with your spouse. But what if you are simply cohabitating? Your current partner may be left out in the cold as all of your assets are rerouted back to your children from your first marriage. 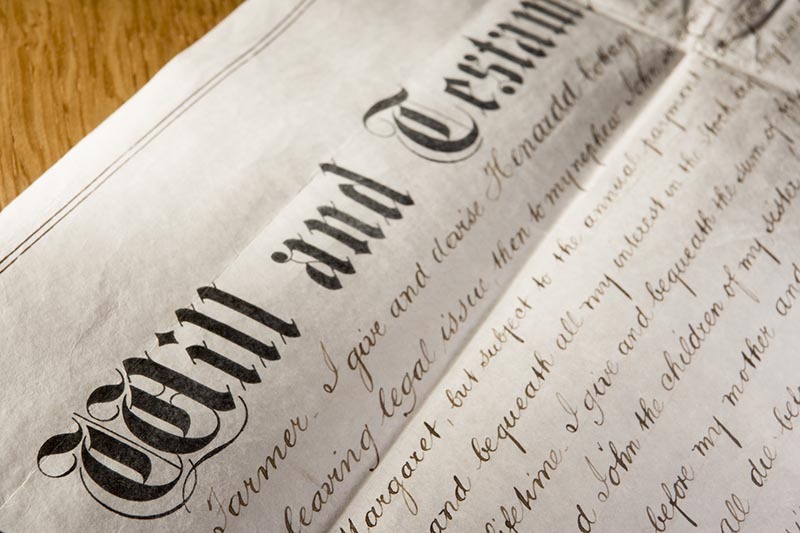 You will need a will to ensure your significant other inherits. This is especially important if you have adult or minor children from a previous marriage. What province you live in makes a huge difference in how your property is distributed by probate when you die. The province in which you are domiciled, or live regularly, is the one that controls the probate of your assets. 5. Where Is Your Stuff? You live in one province, but you own property in another province. The other province's rules of probate may govern the property in that state. This often happens if you own a vacation home or are a snowbird and travel between two locations throughout the year. This can also be a problem if your family doesn't know you have property in other provinces. Having a will prevents that property from being distributed in a way you don't want. Create a will that complies with the laws of the province you currently reside. Include property that is out of your province in the will and what you wish had happened to them. Items that are accounted for in a will are not subject to probate. 6. What Are Your Intentions? Often when parents become elderly they have financial accounts such as chequing and savings accounts with one of their children's names on the account. This effectively creates a joint account. Be careful with this strategy. The Canada Revenue Agency has stated that this doesn't create a true joint tenancy. To create the joint ownership your child will have to report 50% of the income on their return. This may not minimize your probate fees or maximize your family's wealth. This works great while the parent is living to help monitor expenses and ensure the care of elderly parents. Unfortunately, it means that when the parent dies the child becomes sole owner of that account's balance automatically. This may not have been the intention of the parent. A will can prevent things like this from happening, as it would effectively disinherit their other children. Pets can end up in a precarious position when their owners pass away. If no one is there to claim the animal, they could very easily end up in a shelter. By having a will in place you can arrange for someone to take care of your furry loved ones. This will be a smoother transfer ownership process for your pet. You can also arrange for the expenses of your pet to be cared for. The trust can be created automatically upon death and have a designated executor. 8. Are You Taking Care of Someone Disabled or Elderly? Do You Need a Will If You Have a Trust? You currently have power of attorney making you responsible for the care of someone who is elderly or disabled. Who is going to step in and take over if you pass away? A will can protect them from becoming a ward of the state. Specify in your will who will take over the responsibility of care or the managing a trust. You can also arrange to create a trust with estate assets to pay for the care of your loved ones. Upon your passing, a trust will automatically be created with the elderly or disabled named as beneficiary. It may also be wise to have those that you are caring for, create a Personal Directive also known as a living will and a Power of Attorney. 9. But You Already Declared Beneficiaries for Insurance. You can designate a beneficiary for insurance policies, property deeds, and retirement accounts. This works well for these assets, but unfortunately, these are not the total of your estate. The probate process can last months to even several years. There is no need for this if you create a will. The court system doesn't want to have to figure out how you wanted your estate distributed. If you have a will the court can execute your wishes and move forward. The probate process can be lengthy as people discover more of your belongings. When you create a will people will not have to hunt for the items you own, further delaying the close of your probate. To further limit the probate process, you can include a no-contest clause in your will. Often times those that are disinherited or displeased with their inheritance will contest the will's terms. By including a no contest clause you prevent people from fighting over the terms of the will. This will speed the process of asset distribution. Those that are set to inherit MAY have to pay income taxes on the value of the inheritance they receive, especially is a capital disposition or cashing out spousal R.R.S.P.s that do not meet the Rollover requirements. Be thinking and planning about your estate now you can make some financial moves such as gifts and loans that reduce the liability of estate taxes later on. If you are planning on leaving money to your kids you could give them a loan that is forgiven upon death. If they use the money for tuition, vacations, new car, or mortgage payments the loan could be interest-free. You also need to consider if you own property in the United States. The US has different estate tax and probate laws that need to be considered. By determining your estate value now, you can prepare by purchasing life insurance. The payout from the life insurance can be used to offset the cost of the estate tax after you die. When you write your own will, you can select the person who will be responsible for being the executor of your will. If you do not choose an executor, the court will choose someone for you. When choosing an executor, select someone who will be able to competently distribute your belongings and assets. Do not pick someone who will be highly emotional or embroiled in the family drama we spoke of earlier. If you leave your estate to the court to distribute, they will work through a worksheet of predetermined family members for who is to inherit. This means you have no say in who does or does not inherit. If there is a particular member of your family who you do not want to inherit, you must designate this in your will. This also allows you to reduce the inheritance of one particular member. For example, let's assume you have three brothers. Without a will, the court will distribute to your brothers equally. If you write a will, you can decide to give each of your brothers a different amount. You may also have given a gift to a child during their lifetime. In this case, we write in a hotchpot clause stating they do not get a gift because they have been given during their lifetime. You may also want a clause stating someone does not get a gift because you are estranged from them. You may also want an inequal distribution clause explaining why someone does not get a gift as big as they law might think they are entitled to. There is no designation for gifts or donations when your estate is distributed via probate. If you want to give a portion of your assets to charity you must write a will to memorialize this intent. You may not be totally sure how you want your estate distributed, that's ok. What's important is to write your will now, and you can adjust it in the future. As you grow your wealth and asset total you need to go back and update your will to include your new possessions. This is especially important for high-value items such as property. Speak to your attorney about the possibility of creating an editable list of personal items. This allows you to add, subtract, and edit a list of personal possessions as you think and discuss with your loved ones. Do You Need a Will If You Have No Assets? If you have little to no assets then you are a part of the minority that does not necessarily need a will. You have few to no assets. The few assets that you may have will automatically go to your parents or immediate family members via probate. The only reason you would need a will is if this is not how you want your property distributed. Now that you have determined that the answer yes to do I need a will, you need to know how to go about crafting a will that is enforceable. This entry was posted in do I need a will by verhaeghelaw. Bookmark the permalink.